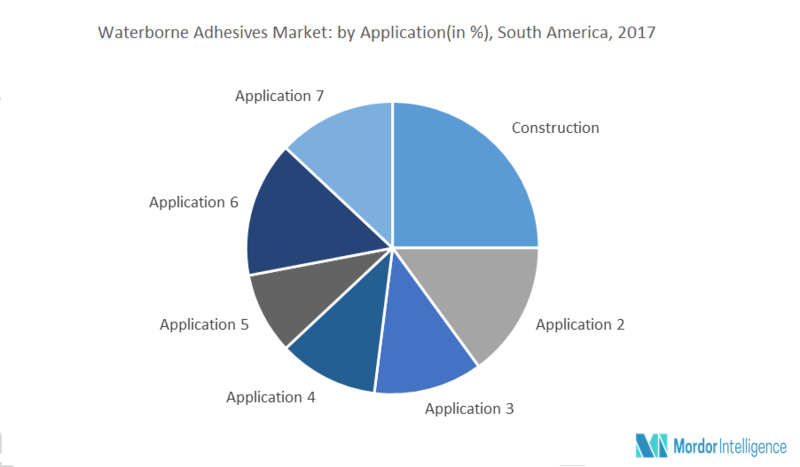 South America Waterborne Adhesives Market is estimated to witness a CAGR of 4.3%, during the forecasted period of 2018 - 2023. Brazil, with a CAGR of 5%, is a major market for waterborne adhesives in South America. Brazil has the most potential in South America region for growth of adhesives market, due to increasing global exposure and support from government funding. Brazil accounts for 60% by volume of the adhesives market in South America. Brazil recently hosted FIFA 2014 and Olympics 2016, this boosted the infrastructure and construction activities which resulted in increasing demand for adhesives. The construction industry will be supported by government programs, such as Minha Casa, Minha Vida program (MCMV), the Logistics Investment Program (PIL), Plano Decenal de Energia 2024 (PDE 2024) and the National Education Plan 2014–2024 This increasingly upward trend of investing in and promoting construction activities has hinted government to make significant funding in adhesives market. Support from government also allows various players, like 3M, Arkema, and The Dow Chemical Co., among others to invest in the adhesives market in South America. In the past few years South America has exhibited a growth in industrialization and urbanization. This growth in industrial sector has resulted in an increased earning and better standards of living. This has led to an improving economy over the years. This shift in the economic status of South America has let to improvements in industries, like Footwear and leather, Manufacturing, Automobiles, and Construction, among others. Adhesives are a highly used material in these markets and thus, the demand for these markets is likely to increase the demand for Waterborne Adhesives. Brazil is the fastest growing country in South America. Brazil holds the largest market in Waterborne Adhesives Market. The growth from Automobile industry and Construction industry are the major drivers for the growth and demand of Waterborne Adhesives Market. Also Government is actively working towards the expansion of adhesives industry and providing for better funding and investments. Major Players: 3M, Adhesives Research Inc., Arkema Group, Ashland Inc., The Dow Chemical Co., Franklin Adhesives & Polymers, Henkel AG & Co. KGaA, Huntsman Corp., Pidilite Industries Ltd., Sika AG, and Yokohama Industries, among others. May 2017: Adhesives giant Huntsman merged with Clariant for USD 14 billion. This merger creates an entity that is 52% held by Clariant. The new entity aims to focus on plastics, coatings, and adhesives market. 8.5 The Dow Chemical Co.